10 events not to be missed in 2018! With the new year now in full flow it’s time to start planning ahead and looking forward to what 2018 has in store! Read on for some great ideas of what Cornwall has to offer this year. Celebrate all things fishy in one of Cornwall’s most distinctive and original fishing ports. Satisfy your appetite with the best seafood you can get whilst enjoying great cooking demos, live entertainment or bidding at the seafood auction. August Bank Holiday Monday sees the annual Cornish celebration of the sea, fishing and seafood at the Newlyn Fish Festival, where you will find more fish than you can shake a mermaid’s tail at! There’s so much going on at Watergate Bay throughout the year; From live music and surfing to Thundercat racing and the iconic Polo on the Beach that takes place on May 18th this year. A much loved, prestigious event this one is not to be missed and introduces the game of beach polo to new audiences, as well as providing a thrilling weekend for those already converted. Watergate Bay has hosted this event for several years and has been growing in popularity, with various extreme sports and a beach bar and BBQ to enjoy on the day as well. Taking place on Friday 22nd-Sunday 24th June this festival is one of the biggest maritime music events in Europe! The town of Falmouth plays host to hundreds of hours of shanty performances, that are free to attend and all donations go to the RNLI. The town will be filled with music, singing and infused with a great community spirit. The Falmouth International Sea Shanty Festival is held at multiple venues throughout the town and is entertainment for the whole family. Following on from the Sea Shanty Festival in Falmouth, this world-famous shanty group plays at the Minack Theatre on Monday 14th May. A truly remarkable event in a stunning setting, but wrap up warm and don’t forget your pasties! 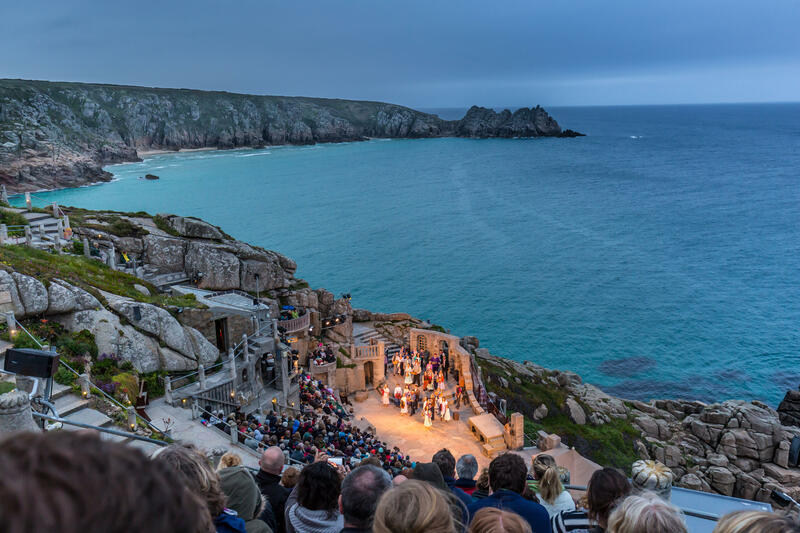 There are so many other events taking place at the Minack this year – make sure you get along at least once to experience this wonderful outdoor theatre. Find out more at the Minack Theatre website. Cornwall maintains a sense of tradition throughout the year, but this is particularly evident during the Spring time, with festivals such as Helston Flora Day, Padstow’s ‘Obby ‘Oss Festival and the St Agnes Bolster Festival. Flora Day takes place this year on 8th May in Helston town, with wonderful outfits and costumes to marvel at and dancing and celebrations in the streets all day long. May Day (or ‘Obby ‘Oss Day as it is known) is the biggest day in Padstow’s calendar and is one of Britain’s oldest festivals. This year it will take place on Tuesday 1st May. The St Agnes Bolster Festival incorporates one of the county’s oldest legends with plenty to entertain all ages. Follow the lantern procession up to the beacon and gather around the bonfire where clay houses are fired and then used the following day to symbolise the village of St Agnes. This year the festival takes place on 5th & 6th May. The Golowan festival (Cornish for midsummer) is the festival of St. John and is held in Penzance each year in late June. Although it is an old tradition, it was revived by a group of artists and local schools in 1991 in order to remember the local area heritage. The festival is ten days long, culminating in the Mazey weekend and notably Mazey Day on the Saturday. This year the Golowan Festival will start on Saturday 23rd June. One of the main acts to grace the stage overlooking the stunning Lusty Glaze beach in 2018 is the atmospheric and silky-voiced stylings of ‘Morcheeba,’ playing on Sunday 22nd July. Check out the Lusty Glaze website. This four-day annual event is famous for the simple reason that Newquay is the surfing capital of England and this is the place to see some of the best surfers and musical acts in the world come together for good times, good tunes, camping, partying and competitive skateboarding and surfing. There’s lots to do in and around Newquay, but this really is what the town is known for. This takes place between 8th – 12th August this year. see the Boardmasters website for up to date Lineups! As well as there being plenty to see and do over the warmer months, Cornwall also has a lot to offer come Christmas time. Many of the towns and villages take great pride in their Christmas light displays, and places like Mousehole and Angarrack (near Hayle) truly have sights to behold. Cornwall is not just for Summer, and it is so easy to feel festive with so many beautiful displays and Christmassy events to enjoy around the county! The Eden Project in St Austell runs events throughout the year, so come rain or shine there is always something to see and do. This year you can find sporting events from the Eden Marathon on 14th October to new interactive exhibits available throughout the year. With so much to do in Cornwall, make 2018 your year and book your perfect family holiday today!